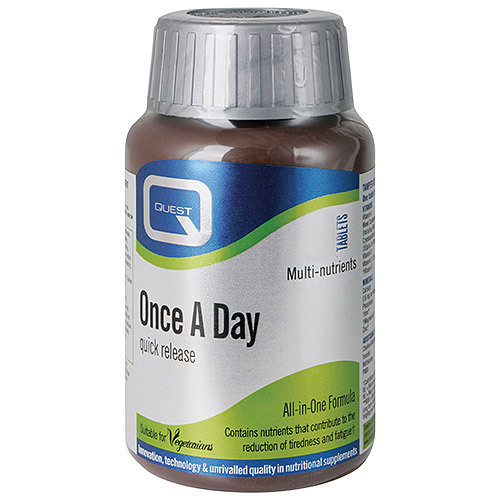 Quest Once A Day is a full spectrum multivitamin and mineral supplement which boasts a quick release formula suitable for those who prefer smaller meals and those with low secretion of digestive enzymes. Why use Quest Once A Day? Multimineral amino acid blend (providing calcium carbonate, magnesium oxide, ferrous sulphate, zinc oxide, manganese carbonate, copper sulphate, potassium iodide, sodium selenite, chromium chloride, sodium molybdate complexed with citric acid, glycine, rice flour, rice protein complex, sodium hydroxide, sodium citrate, aspartic acid and maltodextrin), Non-GM soy lecithin, Vitamin E (natural source vitamin E from non-GM soya), Pantothenic Acid (Calcium Salt), Riboflavin, Vitamin B6 (with methyl cellulose), Niacin (Niacinamide), Choline Bitartrate, Thiamin (with methyl cellulose), DL-Methionine, Inositol, Para-Aminobenzoic Acid, Mixed Carotenoids (with gelatin, sucrose, olive oil, ascorbyl palmitate, Non-GM mixed tocopherols, anti-caking agent: silicon dioxide), Magnesium Stearate, Citrus Bioflavonoids, Lysine HCl, Beta-carotene (with D-a-tocopherol, sodium ascorbate, ascorbyl palmitate, corn starch, glucose), Betaine HCl, Vitamin A (with antioxidant: tocopherols and tricalcium phosphate), Vitamin B12 (with dicalcium phosphate), Biotin (with di-calcium phosphate), Vitamin D3 (with Arabic gum, tricalcium phosphate, D-a-tocopherol), Papain, Rutin, Cysteine, Folic Acid (with dicalcium phosphate), Glazing agent: hypromellose. Below are reviews of Once A Day Quick Release Multivitamin - 90 Tablets by bodykind customers. If you have tried this product we'd love to hear what you think so please leave a review.